Elbow fractures occur in both adults and children, and most are minor fractures that can be treated conservatively. 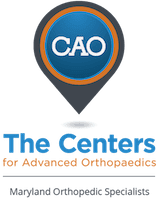 Dr. Peter G. Fitzgibbons, MD at The Centers for Advanced Orthopaedics: Maryland Orthopedic Specialists Division is fellowship-trained in both orthopaedic trauma as well as hand, wrist, and elbow surgery, and is uniquely qualified to care for these injuries. With locations in both Germantown and Bethesda, Maryland, he and a team of orthopaedists, hand therapists, and physical therapists offer a comprehensive range of services covering the diagnosis, treatment, and recovery from elbow fractures. What exactly is an elbow fracture? An elbow fracture is a break in one of the three bones that make up the elbow joint. In adults, these fractures are either stable, meaning the elbow can be moved very quickly, or unstable, meaning surgery is likely required to stabilize the bones. Elbow fractures in adults are rarely treated with cast or splints because those are prone to making the elbow become stiff and lose function. With either non-surgical or surgical treatment, range-of-motion exercises, often with a therapist, are started quickly to avoid stiffness. In children, elbow fractures are very often able to be placed into a cast to heal since kids are much less likely to have a problem with stiffness after immobilization. Because of the number of growth plates in the elbow that can’t be seen on x-ray, pediatric elbow fractures can sometimes be difficult to diagnose. Occasionally pediatric elbow fractures will require surgery which usually means stabilizing the bone temporarily with pins. Unlike adults, children usually don’t require formal physical therapy to regain motion. Surgery for an elbow fracture is often an outpatient procedure done with general anesthesia, but is sometimes performed in the hospital. Dr. Fitzgibbons performs outpatient surgeries at the Massachusetts Avenue Surgery Center, and hospital-based procedures at either Shady Grove or Suburban hospital.